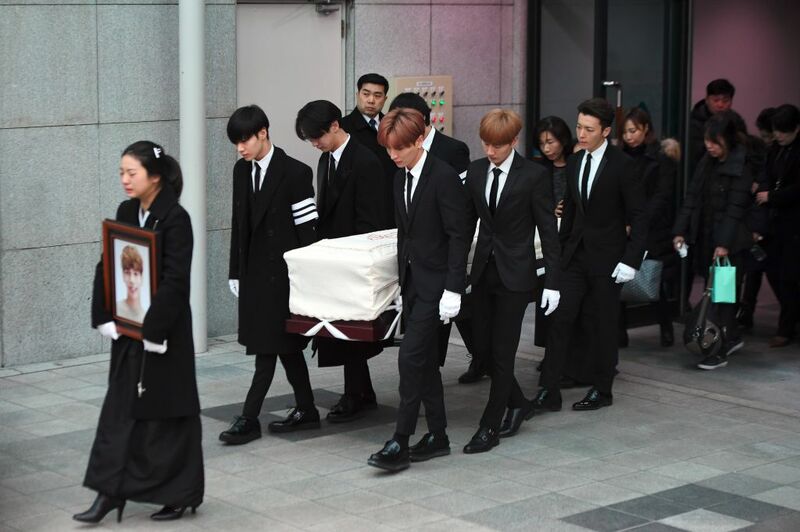 K-pop’s biggest stars, including remaining members of SHINee, carried their lost friend’s coffin at a very emotional funeral. 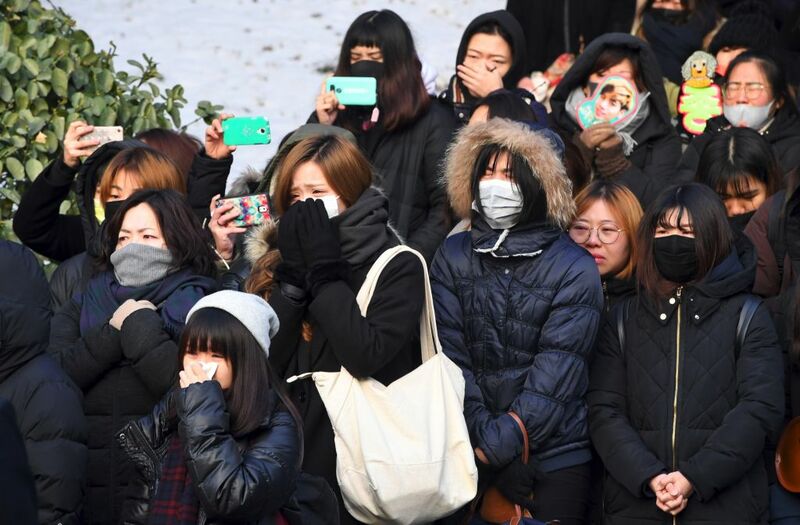 Kim Jong-hyun, who took his own life, was carried out by three of his former bandmates as an army of weeping fans lined the streets to say one last goodbye to their hero. 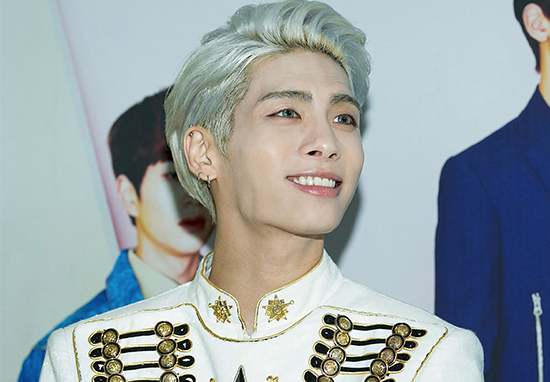 Jong-hyun was found unconscious in his flat at the beginning of the week in his luxury flat in the affluent Gangnam district in Seoul, he was quickly taken to hospital but unfortunately died. The 27-year-old pop star left behind a suicide note which he gave to his best friend and fellow K-pop star Nine9. She was instructed by him to publish the note on Instagram in the event of his death. His body was taken from the Asan Medical Centre in Seoul to an undisclosed funeral home where a private service took place. His coffin was carried by three members of his band, SHINee, and three members of the group Super Junior, another K-pop act managed by the same agency, reports the Daily Mail. Kim’s funeral procession was led by another bandmate from SHINee who held a plaque which read ‘Kim Jong-Hyun, believer’, followed by Kim’s sister who was carrying a picture of her brother. His funeral was also attended by several prominent stars in K-pop including Girls’ Generation, EXO and Red Velvet. A legion of fans who had been camping outside his hospital in Seoul, holding vigils for their hero for the past few days, lined the streets outside. Mainly made up of teenage girls, the crowds could be seen crying as the coffin was taken away. According to Kim’s heartbreaking note, published on Nine9’s Instagram page, he had been suffering from depression and was struggling with living in the public eye. 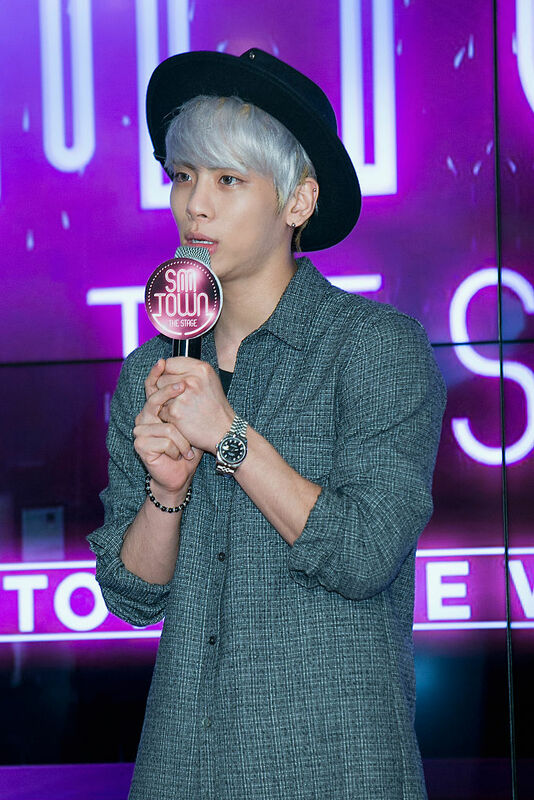 His note explained he ‘was broken from the inside’ and how ‘the life of fame was never meant for me’.
. 종현과 마지막 인사를 하고 왔어요. 웃고 있는 영정사진을 보고서도 저는 여전히 종현이가 제게 다가와 이 모든 게 꿈이었던 것처럼 웃어줄 것 같았습니다. 얼마 전부터 종현이는 제게 어둡고 깊은 내면의 이야기들을 하곤 했어요. 매일같이 많이 힘들었던 것 같아요. 불안한 생각이 들어 가족들에게도 알리고 그의 마음을 잡도록 애썼는데 결국엔 시간만 지연시킬 뿐 그 마지막을 막지 못했습니다. 아직도 이 세상에 그가 없다는 게 믿어지지 않고 너무 괴롭습니다. 지금도 이 글을 올리는게 맞는 건지 겁도 나지만 종현이 본인이 세상에서 사라지면 이 글을 꼭 직접 올려달라고 부탁을 했어요. 이런 날이 오지 않길 바랐는데… 가족과 상의 끝에, 그의 유언에 따라 유서를 올립니다. 분명 저에게 맡긴 이유가 있을 거라고 생각해요. 논란이 있을 거란 걱정도 하고 있습니다. 하지만 그마저도 예상하고 저에게 부탁을 했을 거란 생각에 제가 종현이를 위해 할 수 있는 마지막 일을 해야겠다고 결정했습니다. 이제라도 종현이 혼자가 아니었다는 것을 알아주길 바라요. 그리고 수고했다고…정말 잘했다고… 잘 참아줘서 고맙다고 얘기해주세요… 아름다운 종현아 정말 많이 사랑해 앞으로도 많이 사랑할게. 그곳에서는 부디 아프지 않고 평안하기를 바라. . . 유서 전문입니다. . . 난 속에서부터 고장났다. 천천히 날 갉아먹던 우울은 결국 날 집어삼켰고 난 그걸 이길 수 없었다. 나는 날 미워했다. 끊기는 기억을 붙들고 아무리 정신차리라고 소리쳐봐도 답은 없었다. 막히는 숨을 틔어줄 수 없다면 차라리 멈추는게 나아. 날 책임질 수 있는건 누구인지 물었다. 너뿐이야. 난 오롯이 혼자였다. 끝낸다는 말은 쉽다. 끝내기는 어렵다. 그 어려움에 여지껏 살았다. 도망치고 싶은거라 했다. 맞아. 난 도망치고 싶었어. 나에게서. 너에게서. 거기 누구냐고 물었다. 나라고 했다. 또 나라고 했다. 그리고 또 나라고했다. 왜 자꾸만 기억을 잃냐 했다. 성격 탓이란다. 그렇군요. 결국엔 다 내탓이군요. 눈치채주길 바랬지만 아무도 몰랐다. 날 만난적 없으니 내가 있는지도 모르는게 당연해. 왜 사느냐 물었다. 그냥. 그냥. 다들 그냥 산단다. 왜 죽으냐 물으면 지쳤다 하겠다. 시달리고 고민했다. 지겨운 통증들을 환희로 바꾸는 법은 배운 적도 없었다. 통증은 통증일 뿐이다. 그러지 말라고 날 다그쳤다. 왜요? 난 왜 내 마음대로 끝도 못맺게 해요? 왜 아픈지를 찾으라 했다. 너무 잘 알고있다. 난 나 때문에 아프다. 전부 다 내 탓이고 내가 못나서야. 선생님 이말이 듣고싶었나요? 아뇨. 난 잘못한게 없어요. 조근한 목소리로 내성격을 탓할때 의사 참 쉽다 생각했다. 왜 이렇게까지 아픈지 신기한 노릇이다. 나보다 힘든 사람들도 잘만 살던데. 나보다 약한 사람들도 잘만 살던데. 아닌가보다. 살아있는 사람 중에 나보다 힘든 사람은 없고 나보다 약한 사람은 없다. 그래도 살으라고 했다. 왜 그래야하는지 수백번 물어봐도 날위해서는 아니다. 널위해서다. 날 위하고 싶었다. 제발 모르는 소리 좀 하지 말아요. 왜 힘든지를 찾으라니. 몇번이나 얘기해 줬잖아. 왜 내가 힘든지. 그걸로는 이만큼 힘들면 안돼는거야? 더 구체적인 드라마가 있어야 하는거야? 좀 더 사연이 있었으면 하는 거야? 이미 이야기했잖아. 혹시 흘려들은 거 아니야? 이겨낼 수있는건 흉터로 남지 않아. 세상과 부딪히는 건 내 몫이 아니었나봐. 세상에 알려지는 건 내 삶이 아니었나봐. 다 그래서 힘든 거더라. 부딪혀서, 알려져서 힘들더라. 왜 그걸 택했을까. 웃긴 일이다. 지금껏 버티고 있었던게 용하지. 무슨 말을 더해. 그냥 수고했다고 해줘. 이만하면 잘했다고. 고생했다고 해줘. 웃지는 못하더라도 탓하며 보내진 말아줘. 수고했어. 정말 고생했어. 안녕. What else can I say more. Just tell me I’ve done well. That this is enough. That I’ve worked hard. Even if you can’t smile don’t fault me on my way. [FULL TRANSLATION] Dear Cloud Nine9's post about Jonghyun, containing his final note. On December 18, 2017 at 4:42PM Jonghyun’s older sister reported to Police that her brother was about to commit suicide. We went to his residence in Chungdam and discovered that he had attempted to commit suicide. Emergency responders were with us at the time so we rushed him to the Konkuk University Hospital in a state of cardiac arrest. Before his tragic death, Kim was a member of the group SHINee which quickly became South Korea’s number one pop group. In 2008 they released their debut album The Shinee World. This was followed by four more albums, some of which reached number one on the US Billboard album charts. Kim also had a successful solo career, his first solo album reached number one on the Billboard World Albums chart. If you or anyone you know need someone to speak to in confidence please call Samaritans for 24/7 support on 116 123 for free.